With less than a month to go before Christmas, 'tis the season to score the ugliest sweater out there. In just a few years, the ugly Christmas sweater trend has evolved from a byproduct of hipster culture to an annual tradition embraced by entire families. "I first noticed it in 2011 when people were having ugly sweater parties at home," said Fred Hajjar, cofounder of UglyChristmasSweater.com. The Detroit business is one of the biggest sellers of intentionally hideous holiday sweaters. "I went on eBay and and saw these old Christmas sweaters your grandma would wear, selling for $100 to $300," said Hajjar. At the time, he was running an online business that sold merchandise from TV shows and movies. So he decided to get in on the action. With his brother Mark, he launched UglyChristmasSweater.com in late 2012. The first year, they made $40,000 in sales. "We got into the season late and with limited inventory," he said. But the following year, revenue jumped 300%, and it was up 275% the year after that. 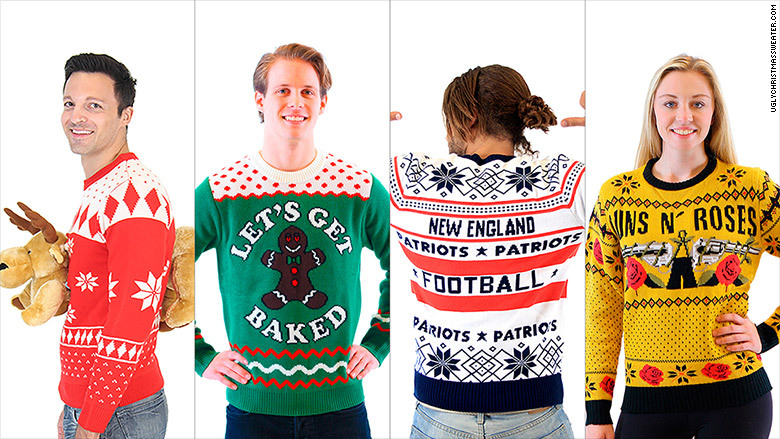 This year, they're on track to sell $5.5 million worth of ugly sweaters. "The momentum has been incredible," said Hajjar. The Hajjars run both their businesses out of a 42,000-square-foot warehouse in Detroit. 30% of the space is dedicated to the sweaters, which are made in China. They have 30 full-time employees, and ramp up to handle the holiday demand -- they added 20 seasonal employees this year. 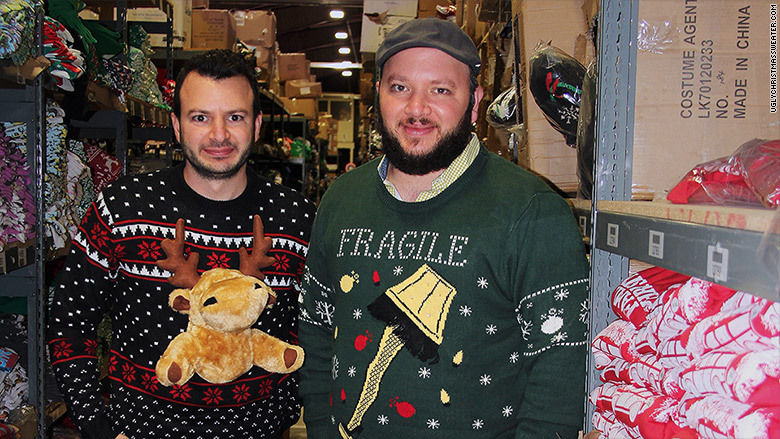 "We also now have two full-time employees dedicated to social media because ugly sweaters are such a viral topic," Hajjar added. The styles have changed considerably in the last three years. Hajjar said the initial idea was to resurface retro holiday sweaters, typically featuring reindeer and Christmas trees. Now, it's anything goes, and the more kitschy and bizarre, the better. This year, Hajjar said there are some new favorites: scratch-and-sniff sweaters, 3D and light-up designs, and raunchier themes. "But it's all in the spirit of fun," he said. In a nod to the ugly sweater's growing popularity, big brands and corporations are also rushing to collaborate. 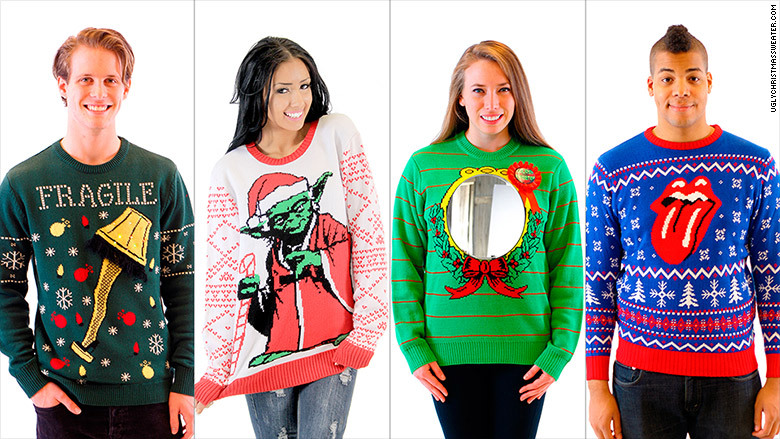 Hajjar got licenses from the NFL, Guns 'N Roses and Lucasfilm (creator of the Star Wars franchise) to make exclusive ugly sweaters this year featuring those brands. And he said Uber placed an order for 500 sweaters that have its logo woven into an ugly design. Some new designs this year feature Star Wars characters, a mirror and scratch-and-sniff designs. "We've even gotten emails from random bars that want to partner with us for their ugly sweater parties for customers," said Hajjar. Hajjar wants to ride the wave for as long as it lasts. For the first time, the online business opened 21 pop-up kiosks in malls across the country. "Honestly, I thought this ugly sweater craze would have disappeared by now, but it's only getting stronger," said Hajjar.